Mobile Shredding on the go! Need to destroy Top Secret documents in the field? Do you have a shredder in the office but need one that is portable and rugged? Dahle’s Deployment Shredder is just the solution. This High Security deployable shredder is approved by the NSA for the destruction of Top Secret data under NSA/CSS Specification 02-01 standards. Features Shred Size - 1mm x 4.7mm Capacity - Up to 8 sheets* Max Hp - 1⁄2 Hp Semi-Automatic Features Moving this machine from one place to another couldn’t be easier! Just place the shredder inside the high impact plastic case and ship to any destination. Inside this case, the shredder is protected by foam padding and an airtight and watertight seal to prevent corrosion. Rolling casters and a pull strap are included and removable for easy transportation. Dimensions (h x w x d) 18" x 16" x 14"
The 20434 DS High Security Shredder is a Security Level P-7 NSA/CSS 02-01 shredder. Need to destroy Top Secret documents in the field? Do you have a shredder in the office but need one that is portable and rugged? Dahle’s Deployment Shredder is just the solution. This High Security deployable shredder is approved by the NSA for the destruction of Top Secret data under NSA/CSS Specification 02-01 standards. The shredder itself features two solid steel cutting cylinders that will reduce paper to a 1mm x 4.7mm particle size. A wooden cabinet and recessed handles make this machine durable and easy to lift. The sliding drawer catches the shredded waste and allows for easy disposal. Moving this machine from one place to another couldn’t be easier! 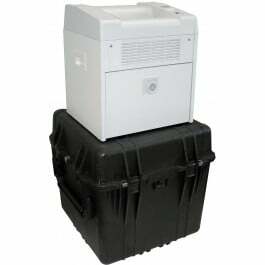 Just place the shredder inside the high impact plastic case and ship to any destination. 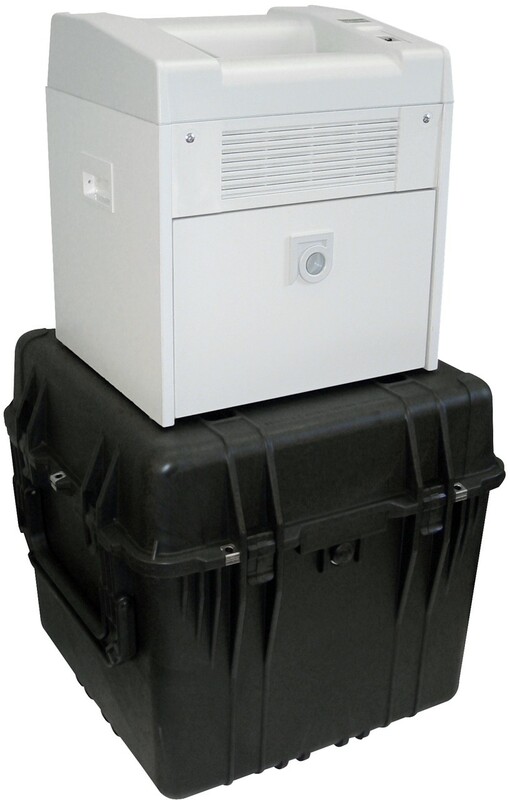 Inside this case, the shredder is protected by foam padding and an airtight and watertight seal to prevent corrosion. Rolling casters and a pull strap are included and removable for easy transportation. As the U.S. continues to face security threats on a global level, Dahle will continue to offer solutions without compromise to operation or dependability. This machine is perfect for military, federal, state or local governments as well as Department of Defense contractors engaged in projects where National Security is an issue. In a world of uncertainty one thing’s for certain, whatever you put through this shredder, we guarantee will never be read again.